Basia Irland, eco and water artist, will be returning to the area on the weekend of March 1-3 to participate with a group of Antioch College and University of Dayton students in an immersive workshop that will focus on the health and biodiversity of local creeks and springs. Participating students will study native medicinal plants, collect sounds from Glen Helen, and create sculptures and medicinal bundles representing a fantastic apothecary. The community is invited to attend a public lecture by Irland on Friday, March 1, at 7:30 p.m. in the Vernet Ecological Center auditorium. Irland will present an overview of 30 years of water projects, which include rainwater harvesting, education on waterborne diseases, object making, and connecting people along the length of rivers. There will be a public ceremony on Sunday afternoon where the artifacts created during the residency will be shared. This residency is the culmination of a collaboration between the University of Dayton and Antioch College that began in June 2012 with the exhibition Source, which included work from Irland's Ice Book series as part of an investigation of artists who work with the seed as source. Irland carves books from large pieces of ice and embeds seeds from riparian waterways to be read as “text.” Irland's work was on exhibition at ArtStreet at the University of Dayton in September 2012 as part of her engagement with the University of Dayton community, and numerous ice books and ice “pages” were created that were then cast into the Great Miami River in a public ceremony. Irland's work can be seen at www.basiairland.com. Also making contributions to Irland’s residency and public lecture are the Tecumseh Land Trust, Wright State University, and Glen Helen. Irland, praised for her ability to cross the disciplinary boundaries of art and science, is internationally known for her efforts and focus on international water problems, specifically waterborne diseases, scarcity, and river issues. This author, poet, sculptor, installation artist, and activist offers a unique perspective on water while studying how eco-communities rely on it. She lectures and exhibits on a worldwide scale and is the recipient of more than 40 grants, including a Woodrow Wilson Foundation Fellowship Grant and a National Oceanic and Atmospheric Research Grant. Irland has been recognized by agencies of both the arts and sciences, ranging from Art in America to the President’s Council on Sustainable Development. In 2007, the University of New Mexico published her book, Water Library, which features many of her international water projects, which have taken place in locations in Africa, Europe, South America, Southeast Asia, the United States, and Canada. 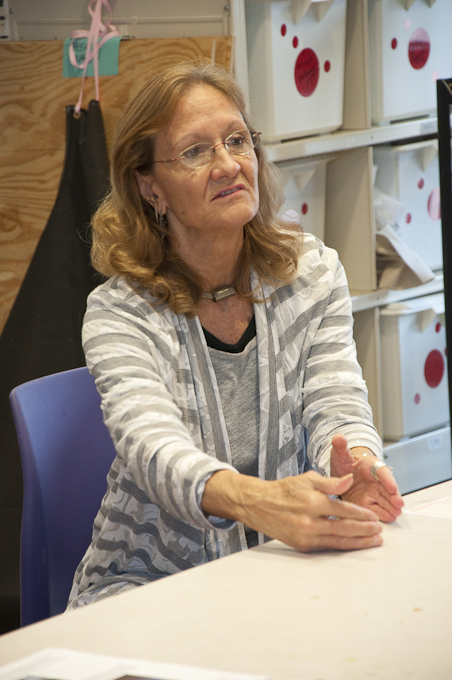 Irland is professor emerita in the Department of Art and Art History at the University of New Mexico, where she established the Arts and Ecology Program. According to Irland, she did not choose this life path: “Water chose me,” she said. Growing up in Colorado, she spent much of her time at the creek that ran behind her family’s home. Many of her childhood pastimes—ice-skating on frozen ponds, skiing, swimming in mountain lakes, and inner tubing—relied on the presence and integrity of water. Irland currently lives in New Mexico. For more information, please contact Dennie Eagleson, creative director of the Herndon Gallery, at deagleson@antiochcollege.org or call 937-768-6462.